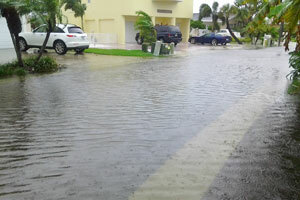 Flood zones, evacuation zones and storm surge are different. They measure different conditions that may not occur at the same time, are determined by different methods and have different purposes. Click here to find out what your flood risk is. Flood zones are areas mapped by FEMA for use in the National Flood Insurance Program. Each flood zone designation, represented by a letter or letters, tells homeowners what the risk is for flooding at their property over a period of years, regardless of the cause. High risk areas, referred to as Special Flood Hazard Area (SFHA) are shown on the map as zones labeled with the letters A or V. By law, all homes in high-risk zones carrying a mortgage must be covered by flood insurance. Everyone in Redington Shores is in the SFHA in either an AE or VE zone. It should be noted that the Base Flood Elevation (BFE) on the maps is only accurate to plus or minus a half foot. For an accurate BFE, refer to the Flood Profiles or Flood Elevation Tables in the Flood Insurance Study. Flood Insurance Rate Map (FIRM): The FIRM is a map published by the Federal Emergency Management Agency that is used by the Town Building Department, Realtors, lending institutions, architects, engineers, and surveyors to determine in which Flood Zone a particular property is located and the base flood elevation (BFE). This information is useful to engineers and architects in building design and insurance underwriters in rating flood insurance policies. Lending institutions are now legally required to mandate that property owners with mortgages must carry flood insurance on properties located in the flood zone. 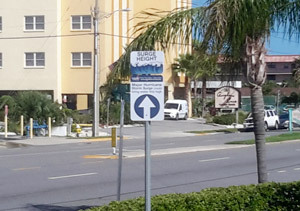 Since Redington Shores is a barrier island, the entire Town is designated a Special Flood Hazard Area and is located in either a VE or AE Zone. The town has several Base Flood Elevation (BFE) heights. The BFE is the height above mean sea level to which the lowest structural member/floor support of a new structure must be elevated to survive flooding so severe that its height is expected no more often than once in a hundred years. Information on the flood zone or the base flood elevation for your property can be obtained by calling the Redington Shores Building Department at (727) 397-5538. Evacuation zones  are based on hurricane storm surge zones determined by the National Hurricane Center using ground elevation and the area’s vulnerability to storm surge from a hurricane. The evacuation zones are marked from A through E, plus non-evacuation zones. The Town is an evacuation zone A. Storm Surge flooding occurs when an abnormal rise of water generated by a storm is pushed toward the shore by strong winds. The entire town is susceptible to storm surge and flood insurance is highly recommended.